Notes: for 2016 this is an assumption that S&P 500 will be in line with the inflation and will growth by 4%. However, value of my today is as of today. If they will perform in line with S&P500 they would worth ~ 220 K.
I was focusing on dividends, while sitting on the pile of cash. In a way in prevented me for going even in a deeper loss. In 2014 it was a winners, as I received almost 1,000 a year more. By 2015 S&P500 would outperform. I was thinking long and hard on whether to publish this performance comparison. It would actually be even grimmer, as EUR lost to USD almost 20% over the period of 4 years. This tendency (EUR depreciating to USD) is likely to accelerate. Western Europe allowed itself luxury of sanctions, conflicts and indulging into expensive politicking. Mainly for the same reason. In the UK (FTSE 100) – 12.9 % of the index are energy companies aka oil & gas. On the other hand, many of the Energy (euphemism for oil & gas) companies lost between 20 to 50% of the market value last 18 months. This was a good example on why individual stocks selected wrongly could compromise your goals. The gap over 5 years is 160 K! 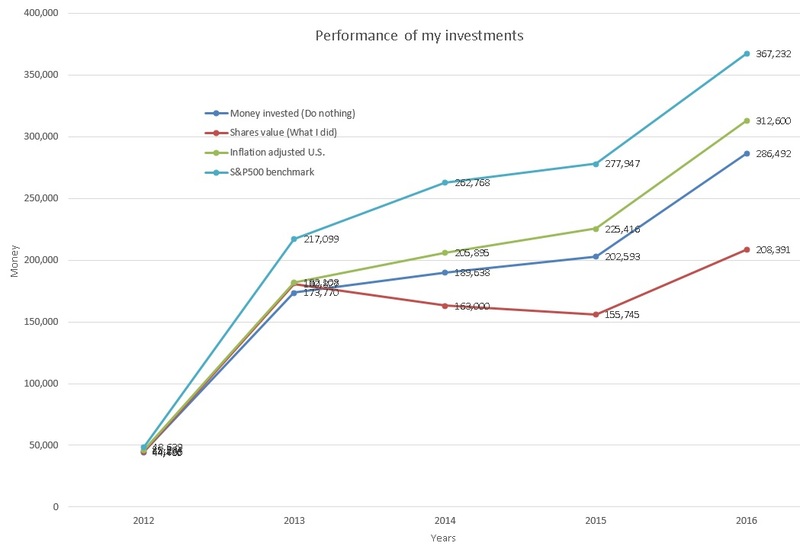 If I would simply keep all the money on a bank account, I would have today 286 K, instead of 208 K.
The results made me thinking about effectiveness of my investment strategy and the emotional attachments. I have now committed to invest in index ETFs (exchange-traded funds) in S&P 500, DAX (German market) and some bond ETFs. I will consider FTSE, however the UK is now actively threatening to break up from EU, while major manufacturers (Rolls Royce, Jaguar Land Rover) are moving new plants overseas only. I will only do the speculative investment with side and unexpected income above my annual targets. Thanks for your courage to share these numbers. It is easy to share positive things. At first it may sound a little bit harsh, but he is right. If the emotional attachment is too high, we should look for alternatives. Thank you for stopping by. To be perfectly honest I was surprised myself. Looking back I somewhat agreed with the commentator and I am planning to do it myself. I think it is still important to invest in the individual stocks and aim to beat the market. If everybody will stick with the index funds there will be no incentive to perform for the companies. The decline could be over, although I do not think so but I think the cycles are shorten now and we should see the declines and raises much more often than before.